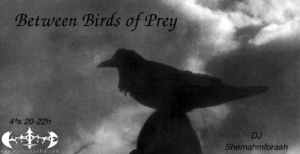 This is the official website of Between Birds of Prey, an online radio show transmitted every Wednesday between 20:00 and 22:00 at http://warfareradio.com. In this radio show, every program focus a different thematic. Emotions, historical events, famous personalities and other themes are explored every week. For instance, Lucifer, Loneliness, Fear or Julius Caesar, to name just a few, have all been used as source for a program theme. In musical terms, this is a greatly varied show, however some musical genres are a constant, such as: Neofolk, Ambient, Neoclassical or classical music.